At Chinese New Year, we had agreed a deadline for various markers of progress with GEI. They weren’t met, they didn’t happen, the magic missing work didn’t appear and so we severally went into job-hunting mode. It needs to be recognised that there was no recrimination and no criticism for this was what could be called a planned exit strategy. We know that what we had been proposing right left and centre was what people want to buy but we failed to find routes through or around the red tape. We failed to generate income. We found several places (almost) worth buying, the best of which had sharks circling it heading to a feeding frenzy. So be it; we have been there and collected yet another T-shirt. Among the people I wrote to was my erstwhile employer, D, albeit with some misgivings, for while I do not like retreat or defeat, returning requires some sort of acceptance of failure and I didn’t think we had failed on all fronts. There is a muddling of thinking there that I accept needs sorting out, but perhaps that will become clear by the end of this piece. One of the applications I made required interaction with the company that used to handle many of D’s recruitment and I spent an hour or so on the phone to one particular guy. During that I realised that there was nothing to be lost and some potential gain to be had by talking to D directly and so sent a cheerful email off. Almost immediately I had a chatty reply and then, not two weeks later, a surprise mail asking about my availability for a short-term contract. Argument ensued about pay and we agreed on the princely sum of ¥1600 per day worked. Tax to be paid, no doubt, perhaps a flight in and out. The reason for the job was the illness of a maths colleague in the centre at Ningbo. Pronounced Ningboah. This nice guy was communicative about his classes and his illness and we have quite an exchange of email on record. So I go from ZQ to NGB with my single 20kg case and the famous Army green bag full of heavy electronic kit (laptop, etc). I’m just in time to catch the start of the new semester. And to catch the leftovers of the syllabus for Further Maths, which predictably included the horror topics; inertia, linear spaces, matrix algebra, differential equations and most of the statistics testing. Frantic revision by me, similar frantic learning by the kids and when I left, just after their mocks, I felt I’d done the best I could in the time available, which must have been six weeks elapsed. Which was all quite fortuitous, as I was forced to work on the maths in a way I’d never have done without the demand of an eager class and the imminence of an exam. None of which describes Ningbo, so I’ll insert that here. 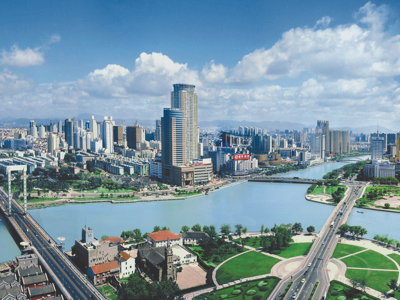 The city lies opposite Shanghai, across an estuary or bay. There is a very long bridge across the estuary and some similar bridges (causeway is almost a better term) to nearby islands. The city is typically large, maybe five or six million, with the school (yet another of the national top 100, keeping my average up) an hour by bus from the CBD and a similar but bigger distance from the airport. The school area, Zhenhai, is close to the sea, maybe a mile and closer to the local river, so my new running pattern soon became to run to the city wall and along that as it turned into the sea wall and ran out into nothing, turn south toward the river, skirt the military docks and then run along the riverside until reaching my residence again – that being the flat of the missing staff member. The sea wall was not on the sea by at least a kilometre, separated from the water by industrial area belching poisons in all directions and preventing local access to the not-beach. Apparently some accessible sand is available some 20km north, not seen. The kids didn’t swim (weren’t able to) much more than non-coastal kids; they didn’t do water sport any more than they do any other sport – hardly at all, then. Being at such a prestigious school, they did work, though. This A2 class was remarkable for its ability range, from Oxbridge (but going to the US) to FM being the 4th A-level and a E/U a realistic grade. The nice lad at the top of the tree was getting a lot more right than me by the time I left. And leave I did, because several interviews with the competition to D occurred in the last three weeks, two moving on to second interviews. So I rediscovered Skype and how, even across China, it doesn’t produce good pictures. And both second interviews went well. The marginally better one turned into an offer I didn’t quite believe at first as it seemed to be too good to be true. So I swiftly arranged a visit to find the catch, talked to everyone I could at both Ningbo and Qingdao, found a way of exiting gracefully, only to be pushed at the northern end into leaving two weeks faster and passing a similar problem back to D – find a Maths master NOW. On the other hand, the Qingdao kids were having no maths delivered in English. I arrived there 1st April with six weeks to the first exam. Hectic is a suitable word. I look forward to hearing how this turns out for all concerned: the ill teacher had an operation and was recovering well last time he wrote back; the NGB kids were on target for realistically better results; the QD kids tell me they feel a rescue has occurred (though that is as much from the Chinese staff getting the message as anything done by the new foreign staff). Ningbo? Well I saw the centre three times. The once I went with C we had a good explore but quite honestly it is much the same as all the other cities we have been to, except that it has a nice river frontage, not as grand as found in HK or Shanghai.